Bakery Tips, Notes, & Batter Spills! Tomorrow my daughter and I are hosting a high tea for some of our friends. 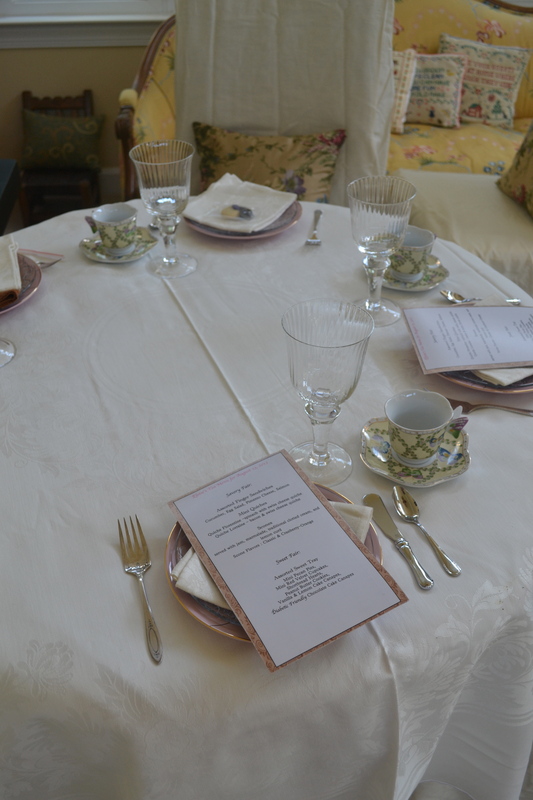 I decided to use this blog to give some thoughts about proper high teas. As a strong believer and lover of tea, this is one of the things I am most looking forward to once we have our storefront. One of my favorite aspects of tea is that it can never be rushed and that it is done in such a way as to make you (each and everyone), feel special. Whether in the dressing of the table, the variety of selection or the fact that someone is serving you; what makes it special, particularly with today’s hectic schedules and societies general rush, is that someone takes the time to have it with you. Presentation : In the spirit of making you feel special, setting of the table is key. And there’s no reason to break the bank on it. Mismatch different coffee saucers you have and use them as plates (remember, everything is in small portions, with a variety of different choices). Or go to a thrift / antique store; often they have vintage, yet reasonably priced platters and plates. Need a table cloth? For my youngest daughter’s 5th birthday she had a ‘teddy & tea’ party; I took a solid plastic pink picnic table cloth that I bought at Walmart. Then to add the party theme I sponge painted white teddy bears around the border and down the middle. Viola; a custom table cloth 🙂 . Other times I have used some of my favorite (clean) dish towels and set them as runners down the center of the table, which works perfectly for having the pot of tea and small plates of treats. Other options which work well – a part from handed down or thrift store linen cloths – are quilts, or sheets tied at the legs with bows or simply cut fabric. Try and anticipate what your guests will need. People often want milk or lemon, and or sugar with their tea. So, have a small pitcher of warm milk (you don’t want it curdling, as well as it blends better) all ready to go. Have the wedges of lemon sliced and strainer ready to catch those pesky seeds. If the lemon is not used toss it in a zip-top plastic bag and it will keep in the fridge for at least a few days. For a refreshing change drop one in your water glass as a way to give a zesty zip to it! Now, you may be reading this and thinking I do not want to have to clean up all those extra dishes. Spare yourself; there are no shortcuts to a really good tea, and unfortunately conserving space in the dishwasher was not a priority for the British. So, my advice? Don’t think about it until it’s over. 🙂 Tea is well worth the effort and plastic is not an option! The Food: As tea is the spirit of ‘feeling special’ and indulged, having a variety of tasty treats plays a direct part in producing the charm. As a rule of thumb, I stick to a minimum of threes. Three savory sandwiches or mini quiches (and remember we’re talking small portions; nothing is served more than 2 bite size), one or two varieties of scones with topping options, and three sweet desserts- truffles don’t count. The food, kept on a ‘buffett side table’ until each course was ready to be enjoyed! Try to keep in mind the flavors used in your selection; remember, we’re not trying to give anyone indigestion. Portions are a mini, or two bite size, as tea is a nibbling affair and was designed to hold you over until dinner, which was served at 8pm or 9pm. 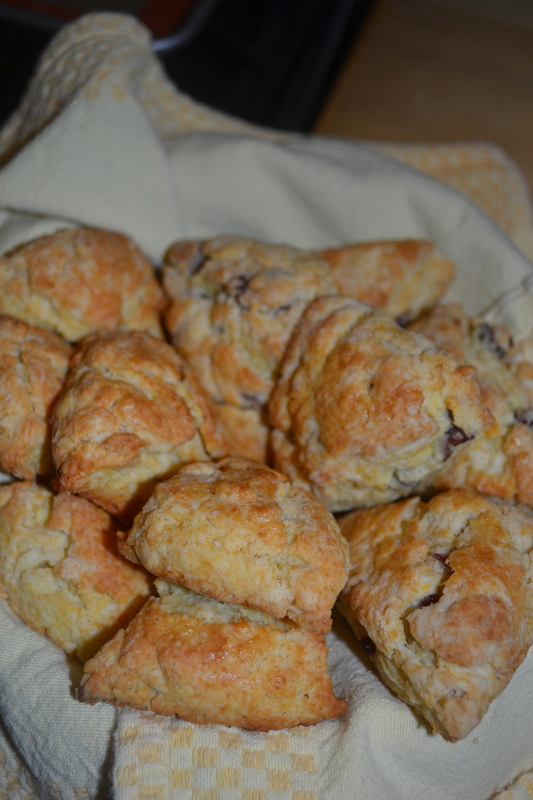 Scones should always be served with a type of jam (traditionally a berry jam) and clotted cream, which is found at any reasonably good grocery store these days, usually where cut cheese is. You can also add a lemon curd and orange marmalade if you would like to be truly authentic.
. Everything eaten is to highlight the tea being drunk, so having a rich decadent brownie might not necessarily be the best choice, as it might overpower your taste buds for the tea. (Even then that depends on the recipe, supposing you have a dark and spice blended brownie it could be lovely). 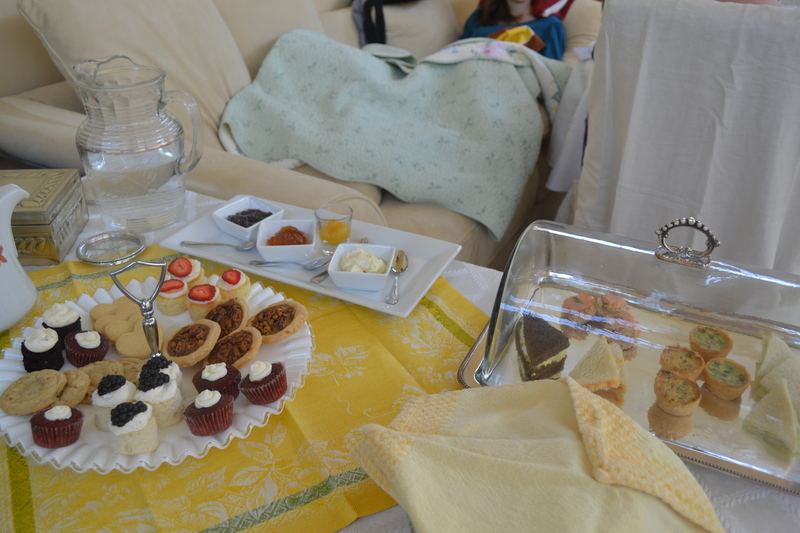 This entry was posted in Cakes & Cool Sweet Treats and tagged food, how to host your own high, proper high tea, scones, tea, tea presentation, tea time snacks by eloisespastries-blogs. Bookmark the permalink.